This Standard is a collection of visual quality acceptability requirements for electronic assemblies. This Standard does not provide criteria for cross-section evaluation. This document presents acceptance requirements for the manufacture of electrical and electronic assemblies. 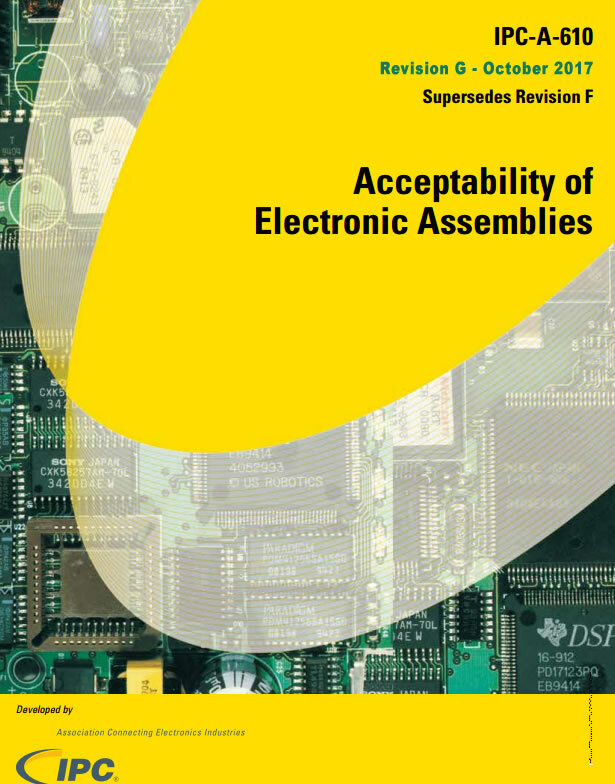 Historically, electronic assembly standards contained a more comprehensive tutorial addressing principles and techniques. For a more complete understanding of this document’s recommendations and requirements, one may use this document in conjunction with IPCHDBK- 001, IPC-AJ-820 and IPC J-STD-001. The criteria in this Standard are not intended to define processes to accomplish assembly operations nor is it intended to authorize repair/modification or change of the customer’s product. For instance, the presence of criteria for adhesive bonding of components does not imply/authorize/require the use of adhesive bonding and the depiction of a lead wrapped clockwise around a terminal does not imply/authorize/require that all leads/wires be wrapped in the clockwise direction. Users of this Standard should be knowledgeable of the applicable requirements of the document and how to apply them, see 1.3. IPC-A-610 has criteria outside the scope of IPC J-STD-001 defining handling, mechanical and other workmanship requirements. Table 1-1 is a summary of related documents. IPC-AJ-820 is a supporting document that provides information regarding the intent of this specification content and explains or amplifies the technical rationale for transition of limits through Target to Defect condition criteria. In addition, supporting information is provided to give a broader understanding of the process considerations that are related to performance but not commonly distinguishable through visual assessment methods. The explanations provided in IPC-AJ-820 should be useful in determining disposition of conditions identified as Defect, processes associated with Process Indicators, as well as answering questions regarding clarification in use and application for defined content of this specification. Contractual reference to IPC-A-610 does not additionally impose the content of IPC-AJ-820 unless specifically referenced in contractual documentation. Purpose The visual standards in this document reflect the requirements of existing IPC and other applicable specifications. In order for the user to apply and use the content of this document, the assembly/product should comply with other existing IPC requirements, such as IPC-7351, IPC-2220-FAM, IPC-6010-FAM and IPC-A-600. If the assembly does not comply with these or with equivalent requirements, the acceptance criteria shall be defined between the customer (User) and Supplier. The illustrations in this document portray specific points noted in the title of each page. A brief description follows each illustration. It is not the intent of this document to exclude any acceptable procedure for component placement or for applying flux and solder used to make the electrical connection, however, the methods used shall produce completed solder connections conforming to the acceptability requirements described in this document. In the case of a discrepancy, the description or written criteria always takes precedence over the illustrations. Standards may be updated at any time, including with the use of amendments. The use of an amendment or newer revision is not automatically required.